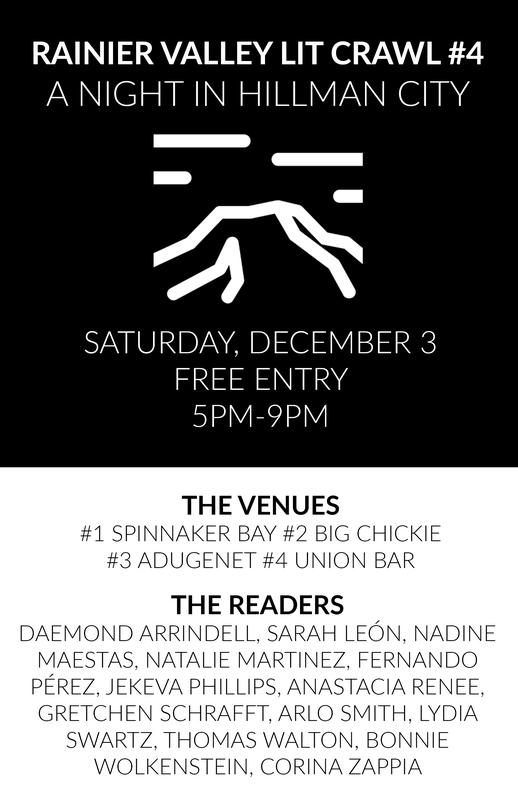 The fourth Rainier Valley Lit Crawl will take place in Hillman City, Seattle, on Saturday, December 3rd. Four venues. Thirteen readers. And you. This event encourages diverse audiences. Enjoy an evening of literary arts, good food, and strong community in the Rainier Valley. The fourth Rainier Valley Lit Crawl takes place in Hillman City, just minutes south of Columbia City and just minutes north of Rainier Beach in Southeast Seattle. All four venues are located right along Rainier Ave, making this event accessible by public and private transport alike! Each of the four readings will last approximately 40 minutes to allow time of travel between each venue. We encourage all attendees to support the local venues via consumption of the delicious food and drink. Venues include: Spinnaker Bay (Washington’s first female-owned brewing company), Big Chickie (providing the best damn rotisserie chicken in Seattle), Adugenet (serving Ethiopian Breakfast all day long), and Union Bar (for relief from your various labors). Posted in Others Poetry, Past Events. Bookmark the permalink.